You are currently browsing the tag archive for the ‘California Islands Symposium’ tag. The California Islands Symposia have been held more or less, every five years since 1965, to share up-to-date information about the management, scientific research, work in all disciplines of natural and cultural science and general well-being of the California islands. The 9th California Island Symposium for 2016 is being held at the Marriott Hotel, Ventura, California. One of the less scientific and more entertaining presentations of this symposium will be the Art Exhibit that has been advertised for more than six months. The three jurors worked hard and with diligence to put together a coherent show that will present the Channel Islands to the public in an inviting and interesting manner. After the symposium, the exhibit will be moved to the Santa Barbara Botanic Gardens, where it will be on display for another three weeks. The Channel Islands of California comprise eight islands located in the Pacific Ocean off the Southern California coast. Five of the islands and the surrounding waters are part of Channel Islands National Park and the Channel Islands National Marine Sanctuary. The Park is supported by many partners who share the protection of the history and prehistory, the cultural and biological diversity as well as protecting vital habitat for marine, terrestrial plant and animal species. Public appreciation through education, interpretation and research is widely promoted. Isolation over many thousands of years has developed unique animals, plants and archeological resources found ONLY on these islands and makes is possible for visitors to experience the western coast of the North America as it used to be. Malva assurgentiflora, the Island Mallow, Mission Mallow, Royal Mallow, Island Tree Mallow. © 2016, Estelle De Ridder, all rights reserved. Watercolor and colored pencil on drafting film and paper. 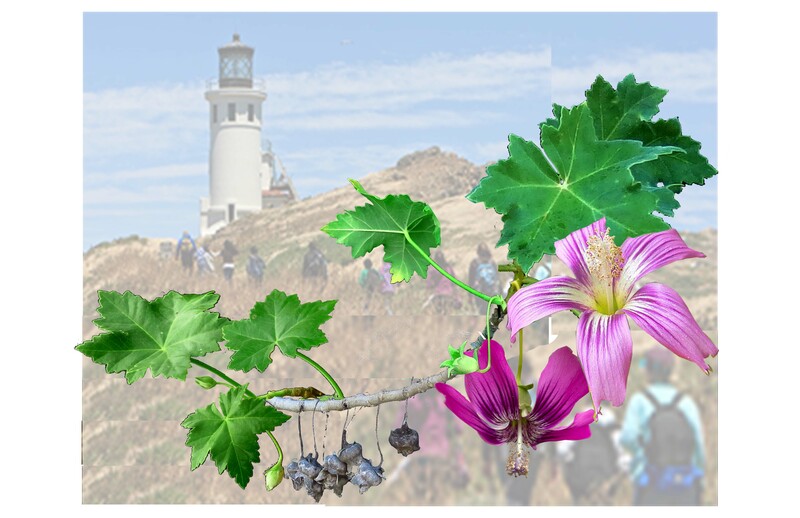 Flora on the Channel Islands include a unique subspecies of pine, oak and island tree mallow. Santa Rosa Island holds two groves of the endemic to the island, Torrey pine subspecies Pinus torreyana var. insularis. Torrey pines are the United States’ rarest pine species. The islands also house many rare and endangered species of plants, including the island barberry, the island rush rose, and the Santa Cruz Island lace pod. Giant kelp forests surround the islands and act as a source of nutrition and protection for other animals. BAGSC members Estelle De Ridder, Mitsuko Schultz and Ellie Tu are participating in the exhibition. 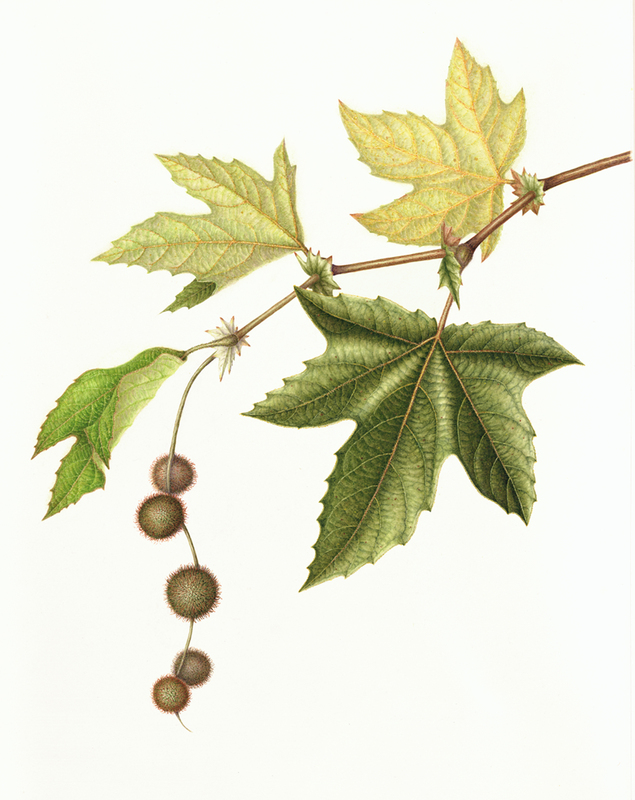 Estelle has illustrated two species: Malva assurgentiflora and Heteromeles abtutifolia. Malva assurgentiflora, the Island Mallow, Mission Mallow, Royal Mallow, Island Tree Mallow, Malva Rosa is a species of flowering plant in the mallow family. It grows into a strikingly architectural shrub/small tree with beautiful white bark. It is endemic to California, where it is native only to the Channel Islands. It can also be found growing as an escapee from cultivation in coastal mainland California. 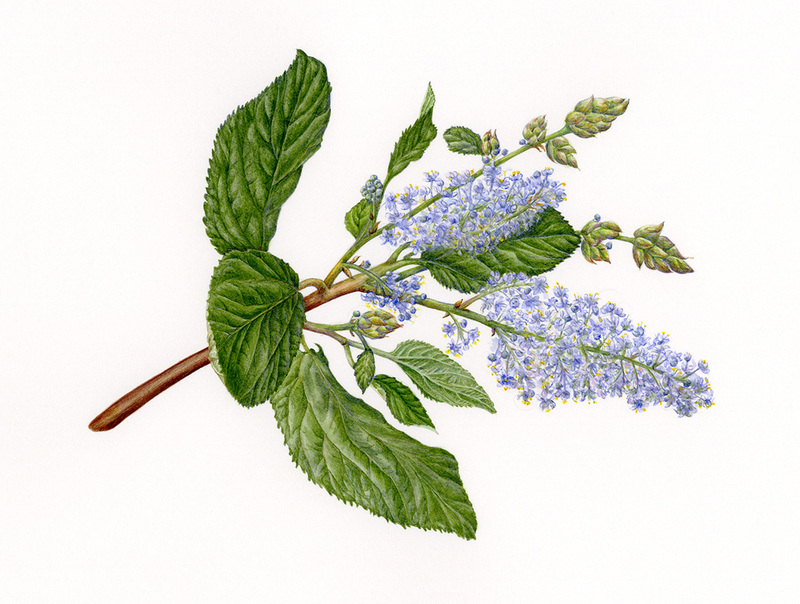 Estelle’s painting of Heteromeles abtutifolia was done on paper with watercolor and colored pencil. Heteromeles abtutifolia, Toyon berry, grows on the north-facing coastal bluffs of Santa Cruz Island. It grows on all the other islands, except Santa Barbara island, and was planted on San Nicolas. Mitsuko Schultz had her Platanus racemosa, California Sycamore accepted to the exhibition. Ellie Tu has three pieces in the exhibition: Dudleya greenei, Coreopsis, and Leptosyne gigantea Kellogg. Leptosyne gigantea Kellogg (formerly Coreopsis gigantea), Giant Coreopsis is a strikingly strange plant. It grows on dunes, rocky cliffs and exposed slopes, and has a fleshy trunk and branches. It can reach heights of eight feet with a five inch trunk. It is deciduous and dormant in the dry season, taking on an other worldly appearance when visitors hike through a large stand of them. In spring, however, masses of bright yellow blooms put on quite a show. Ceanothus arboreus, Feltleaf Ceanothus, or Island Ceanothus. Watercolor, © 2016, Ellie Tu, all rights reserved. 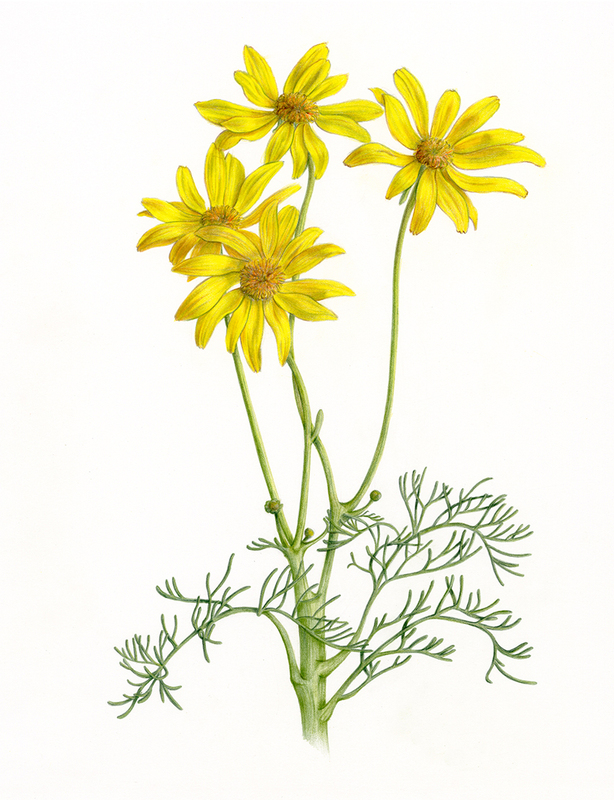 Leptosyne gigantea Kellogg, (formerly Coreopsis gigantea), Giant Coreopsis, Ellie Tu, colored pencil, © 2016, all rights reserved. 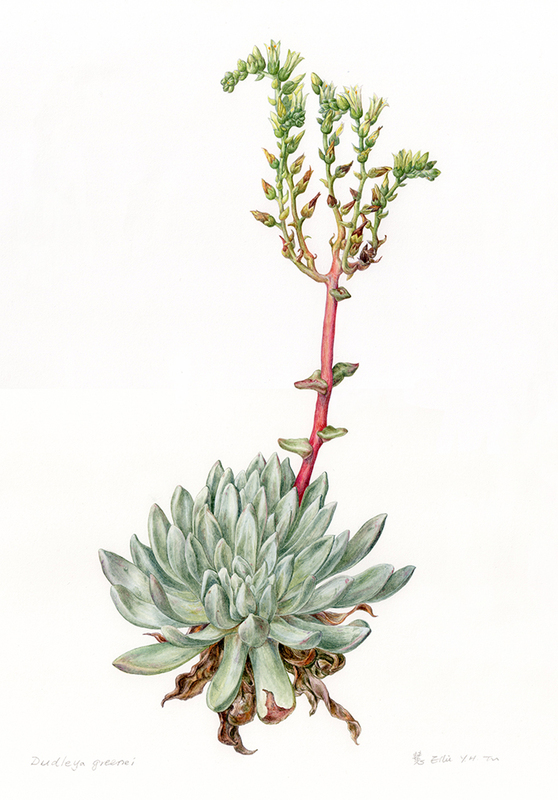 Dudleya greenei, watercolor by Ellie Tu, © 2016, all rights reserved. This plant grows in the Channel Islands National Park. The 9th Annual California Islands Symposium is holding a juried show in conjunction with the National Park Service Centennial Celebration. Artists are invited to enter original artwork in any two-dimensional medium that reflects the beauty and uniqueness of the California islands. All entries must depict the flora, fauna, or landscapes of the California islands. The show will be hung for the duration of the conference. A special showing at the Santa Barbara Botanic Garden will follow. Cash prize awards. The California Islands Symposium and National Park Service believe that including the arts in the international symposium is a critical component in cultivating a greater appreciation of the unique California islands. All winning entries and the Conference Choice entry will be published on the California Islands, Channel Islands National Park, and Santa Barbara Botanical Garden websites. Open to all artists. Artists are invited to enter original artwork in any two-dimensional medium that reflects the beauty and uniqueness of the flora, fauna, and landscapes of the California Islands. Entries may include up to three digital images. Artists will pay one entry fee for three images. All work must be .jpg file at least 300 dpi. It is crucial that all images be on the highest quality so our judges can fully appreciate and scrutinize your entry. All artwork will be juried by digital image. Criteria for acceptance will include artistic presentation and technical use of medium, represented by a high-quality digital image. Artists whose work has been accepted will be notified by email by July 30, 2016. Winners will be selected by judges; final choices will be confirmed in person at the conference. The Conference Choice winner will be chosen by attendee votes at the conference. For further information, please check the California Islands Symposium website, http://www.californiaislands.net/symposium or contact Paula Power, (805)658-5784. Bruce Everett, Professor Emeritus, California State University Northridge, is a renowned landscape painter with over 50 years of experience teaching at the college level as Professor of Painting, Drawing and Design. His work is represented in museum and corporate collections, public commissions, and has been shown in numerous solo and group exhibitions. Everett’s work appears in many publications including L.A.Rising: SoCal Artists Before 1980. Hank Pitcher, painter of California culture and the coastal landscape, is a Senior Lecturer SOE of the College of Creative Studies at the University of California, Santa Barbara, where he has been part of the core faculty since 1971. A cross-disciplinarian active in conservation, Pitcher is a member of the Advisory Committee of the University of California Natural Reserve System, the Oak Group, and supporter of numerous local and national conservation organizations. He is represented by Sullivan Goss, An American Gallery, Santa Barbara. Karen Kitchel is intrigued by concepts of native vs. invasive, and landscapes that contain stories of human exploration, occupation, and change. The resulting paintings combine meticulous craftsmanship with a conceptual point of view and aggressive, minimalist presentation. Kitchel’s oil paintings have been featured in exhibitions throughout the U.S., and are in numerous private and public collections worldwide, including the Denver Art Museum, the Palm Springs Art Museum, and the U.S. State Department, among others. Karen Kitchel was born in Battle Creek, Michigan and graduated from Kalamazoo College and Claremont Graduate University. She has exhibited professionally for over thirty years, and is represented by Robischon Gallery of Denver, CO, and Gerald Peters Gallery of Santa Fe, NM and New York, NY.